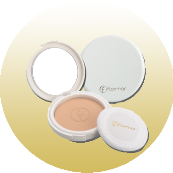 Hello Makeupoholics, so here it is my review on my current favorite Compact Powder by FLORMAR. Hope you like it and find it helpful. Flormar history begins in 1970 in Milan, Italy. In 1986 production was moved to Turkey, using modern techniques in plant and factory in Istanbul. It spreads perfectly on skin got to do to allow the silky look. • Creamy texture( powdery creamy ) but somehow it works well for my oily skin. • It gives you a very smooth and nice finish. • Doesn’t give a dull or cakey look. • Mainly Suitable for normal to dry and less oily skin types. • Application with a brush is recommended for light application. • Quite affordable and gives a clean look. • Shade selection: Varieties of shades are available. • Its light weight , blendable and lasts long. Price: Well it comes with a price tag of Pak Rs 270. and you can find it from any big Departmental Store. Definitely YES for Normal to Dry and less Oily skin types, as it gives smooth finish with such an affordable price. Flormar products are too good and affordable. Love your review. Thanks sana for sharing it.